The spectacular outcome of years of diligent development, the Breguet Double Tourbillon includes a hand-wound movement fitted with a pair of tourbillon regulators rotating on the hour axis. An aesthetic as well as a technical masterpiece, the watch features today a pink gold case 44 mm in diameter housing over 570 components, all painstakingly assembled by Breguet’s master watchmakers. Working independently from one another, two tourbillons are coupled by means of differential gears and mounted on a rotating centre plate effecting a complete revolution in twelve hours. The differential device conveys the two tourbillons’ mean rate to the rotating centre plate and to the time-display mechanism. The rate of the watch is thus the mean rate of the two tourbillons, making its movement twice as precise as a normal one. 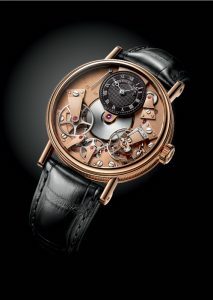 The hour is shown by the bridge connecting the tourbillon regulators doubling as a watch hand, while the minutes are indicated by a standard hand at centre. Impeccable finish and spectacular new engraving work on the back of the movement further underscore this exceptional timepiece’s appeal. A manually engine-turned mainplate, a chapter ring inscribed with Roman numerals, pink gilt Breguet hands, a movement with decorated bridges and bars and other parts beveled and polished further testify to an exceptionally handsome design of unrivalled beauty and refinement. First introduced at the 2006 Basle Fair but initially available in insufficient numbers, this grande complication design with double tourbillon was in 2008 delivered to Breguet clients who had ordered the watch, often paying in advance. 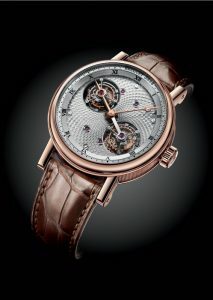 Despite an increase in recent orders joining as yet undelivered earlier orders, newly added manufacturing capacity has allowed Breguet to schedule delivery of the first pink gold models for the end of 2009. Unique in the history of watchmaking and symbolic of Breguet’s own origins, the emblematic Tradition 7027 design returns in a two-color version. Its now-celebrated caliber 507DR displays the entire movement, built on either side of the mainplate though mostly on the front of the plate. Its pink gold case holds an anthracite grey movement that emphasizes its bridges and bars, in particular the escapement’s, fitted with its celebrated old-style “pare-chute” in hand-beveled steel. The movement proper has received a grey anthracite surface treatment, basically an improved electroplating technique, employing an alloy of precious metals of the platinum family darker in hue than the ruthenium traditionally favored by watchmakers. The visual contrasts between the anthracite movement and the pink gold case add to the watch’s crisp contemporary good looks with a revolutionary touch or two, not least the time of day displayed on a lustrous black dial off-centered at 12 o’clock. The Tradition 7027 is also available in pink gold with pink gold mainplate, bridges and bars or in a white gold case fitted with the new anthracite movement. Another achievement of Breguet’s acoustic laboratory, the Classique Grande Complication 7639, “senior” companion piece to the 7637 design, adds the prestige of baguette diamonds to the minute repeater function. Ideal for conveying sound vibrations beyond the case, diamond’s hardness and pureness further improve the watch’s sonority by reducing vibration loss to a minimum. Following the lead of major sound-system specialists whose loudspeakers now feature diamond conduction, Breguet has decided to introduce a fully diamond-set design whose setting is as perfect as the acoustic performance of its minute repeater. Watch 7639 emits a spectacularly pure sound that is certain to delight any connoisseur of ringing or chiming Grande Horlogerie. Including its bracelet attachments, crown and dial, the case is entirely covered in invisibly set diamonds that turn the watch into a fabulous gem.